For the first time, direct evidence of lightning has been detected on Mars, say University of Michigan researchers who found signs of electrical discharges during dust storms on the Red Planet. The bolts were dry lightning, says Chris Ruf, a professor in the departments of Atmospheric, Oceanic and Space Sciences and Electrical Engineering and Computer Sciences. "What we saw on Mars was a series of huge and sudden electrical discharges caused by a large dust storm," Ruf said. "Clearly, there was no rain associated with the electrical discharges on Mars. However, the implied possibilities are exciting." Electric activity in Martian dust storms has important implications for Mars science, the researchers say. "It affects atmospheric chemistry, habitability and preparations for human exploration. It might even have implications for the origin of life, as suggested by experiments in the 1950s," said Nilton Renno, a professor in the Department of Atmospheric, Oceanic and Space Sciences. The findings are based on observations made using an innovative microwave detector developed at the U-M Space Physics Research Laboratory. The kurtosis detector, which is capable of differentiating between thermal and non-thermal radiation, took measurements of microwave emissions from Mars for approximately five hours a day for 12 days between May 22 and June 16, 2006. 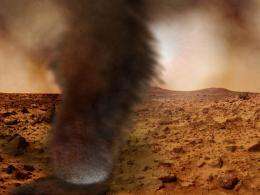 On June 8, 2006 both an unusual pattern of non-thermal radiation and an intense Martian dust storm occurred, the only time that non-thermal radiation was detected. Non-thermal radiation would suggest the presence of lightning. The researchers reviewed the data to determine the strength, duration and frequency of the non-thermal activity, as well as the possibility of other sources. But each test led to the conclusion that the dust storm likely caused dry lightning. This work confirms soil measurements from the Viking landers 30 years ago, and it challenges 2006 experiments that suggested otherwise. Data from the Viking landers raised the possibility that Martian dust storms might be electrically active like Earth's thunderstorms and thus, might be a source of reactive chemistry. But the hypothesis was untestable. In 2006, using theoretical modeling, laboratory experiments and field studies on Earth, a group of planetary scientists suggested that there was no direct evidence that lightning occurred on Mars. This new research refutes those findings. "Mars continues to amaze us. Every new look at the planet gives us new insights," said Michael Sanders, manager of the exploration systems and technology office at Jet Propulsion Laboratory and a researchers involved in this study. Oh great, now every expedition to mars will have to be equipped with $13,000,000 worth of lightning protection equipment.